After some time in the same house with the same décor, you may find it all starts to look boring. Your windows are an especially important focal point of your home that can make or break the design. If you’re tired of the same old window treatments, it’s time to revitalize your windows with a little change in décor. Plants are often considered an outdoor decoration piece, as they can be messy. However, by inviting the lush green of nature indoors, you’ll liven up your home’s color palette and make your windows a more interesting centerpiece. 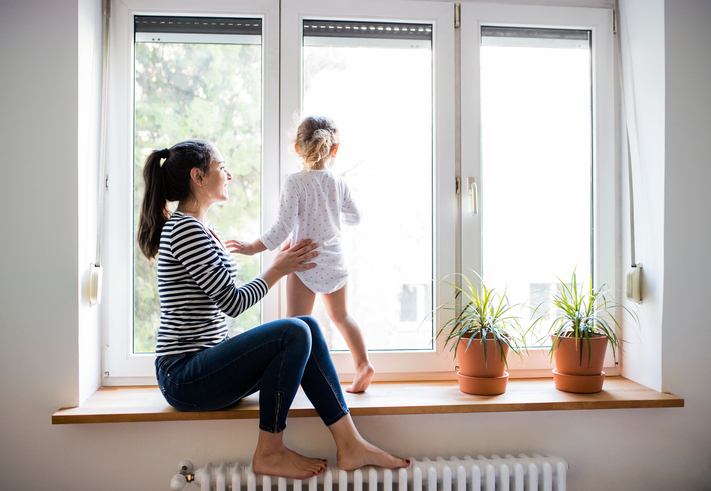 Additionally, indoor window plants can help improve your home’s indoor air quality, ensuring you and your family breathe easier. Take advantage of all the beauty and functionality Mother Nature has to offer your home. If you want to draw attention to your windows, framing them with wall hangings can highlight that area of the room. Décor such as art, mirrors or other wall decorations serve to point out your home’s focal points. Place a large or particularly detailed hanging between two windows or surround a window with various art pieces. As guests seek to examine your décor, their eyes will fall on your windows as well, accentuating your home’s natural light or view. Sometimes, you want to highlight the natural light from beautiful windows but not necessarily the view. In these cases, you can install outdoor hangings that will block the view or add a new focal point to divert attention from other areas. A flowery trellis in front of the window offers a gorgeous floral view, while a bird feeder, flower box or outdoor window hanging is just something interesting to watch. Of course, you can never consider dressing up windows without considering the classic look of drapery and blinds. These oldies-but-goodies are perfect for rounding out a room design and bringing your personal style to life. Layer textured, patterned or solid-colored drapes to play up your room’s color palette or theme. Blinds, too, don’t have to be boring and white. Consider matchstick, Roman or shades to change up your home’s lighting on a whim. Whether you want to draw attention away from a terrible view or highlight your home’s lighting, dolling up your windows can help renew your home. To learn more about maintaining beautiful windows, contact Allied Siding and Windows online or call 713-946-3697.